Once again, the drama between Cherubimon and Ophanimon overshadows anything the kids are going to be up to. What's going on between the Celestials is a tragic story of two sides desperate to reconcile but unwilling to make the sacrifices necessary to make that happen. 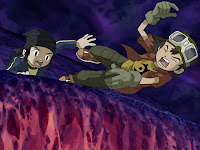 The digidestined are mere soldiers acting on behalf of the good guy. While our heroes play their parts dutifully with no sass, their parts are dramatic enough, overcoming some nasty obstacles as they set the stage for the real action. Even if it's not the case, they still feel like the main characters and for once that doesn't seem like a bad thing. For example, the battle between Aldamon and Beowolfmon feels right. After seeing what Loweemon did to Illusion Cherubimon, the real one makes adjustments to reduce Loweemon's effectiveness, creating the kind of environmental advantage that should be played with a lot more often in this series. Aldamon and Beowolfmon bum rush him, which works, then hit him with a barrage of attacks, which doesn't. Cherubimon clearly feels them, but shrugs them off, which is far better than pretending they didn't hit at all. Takuya and Koji struggle but are eventually overwhelmed. 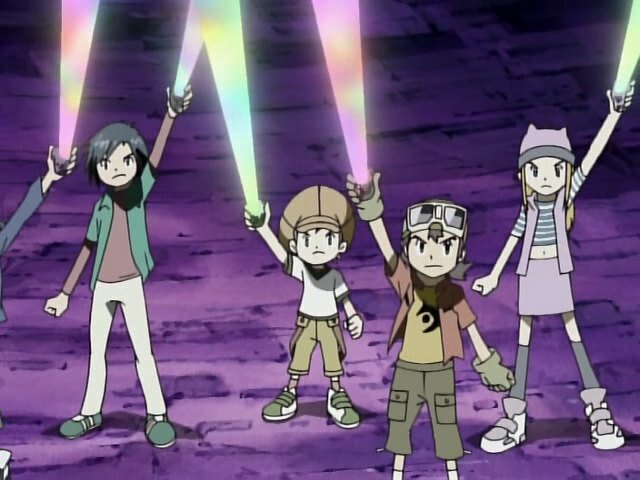 Upon defeat, Cherubimon ups and takes their D-Tectors, finally getting us back to all the spirit stealing that made the Grumblemon episodes tolerable. In the meantime, the others are stuck with the menial task of getting Ophanimon out of the cage. 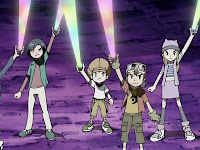 Except Cherubimon's tricky light show makes it a little more complicated. It takes a bit for the B-Team to figure out that breaking a series of mirrors will weaken the bars. The ensuing smashing episode feels like one of the last chances to show off the abilities of these four as we prepare to demote their roles from insignificant to completely unnecessary. Congrats guys, you're good enough to smash a mirror. Except you, Kazemon; let's all laugh at how pathetic you are. Eventually Cherubimon returns and makes quick work out of everybody except Zephyrmon. With her pinned down (like she was ever going to put up a fight), Ophanimon breaks out of her cage and just like that, the kids are put to bed and it's time for mommy and daddy to talk. This is where the legitimate drama happens. Ophanimon insists that she didn't want to push away Cherubimon, Cherubimon hates the idea of having to fight Ophanimon, and both are trying to avoid the inevitable. 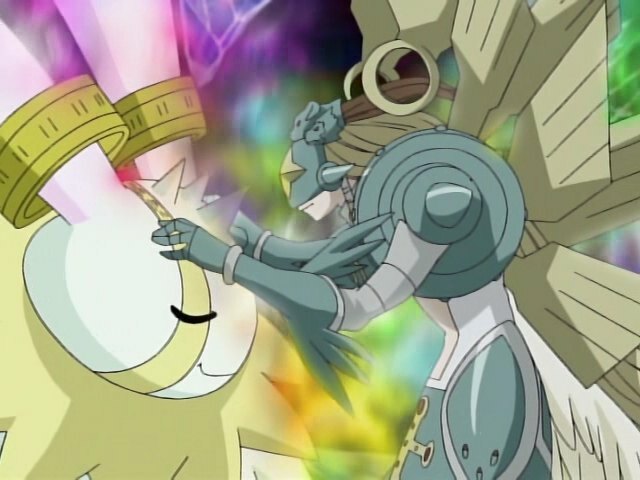 In a way, it's unfortunate that it's ultimately Lucemon that had gotten into Cherubimon's head. Eliminate that and the factors are so simple that it's heartbreaking. Cherubimon feels like he's not being heard, there are little miscommunications, and then he gets a little paranoid. Then, suddenly, the world is at war again. As we don't know about Lucemon's role, we can feel the pain on both sides here. By this point, Cherubimon is dead set on ruling with an iron fist, yet the one thing he can't stand is opposing Ophanimon. It's probably why he spared Seraphimon and took her away in the first place. Fact is, even against a hostile Ophanimon and with all the leverage in the world, Cherubimon is still negotiating honestly. She exposes a glimmer of the good side, then is able to convince him that she can take the darkness away and make it all better. Maybe it's that brief moment of Happy Cherubimon that reminded him of how much better it feels to be not evil, but his submitting to her is not only allowing Ophanimon to pull off the mother of all backstabs, it's almost his way of conceding the battle. Considering how it's the only way the kids could get their D-Tectors back, it ultimately is. Once the jig is up, Ophanimon doesn't last much longer. She uses the last of her energy to cement Takuya and Koji's positions as the only kids that matter, but at least it requires a bit of collectively using the Force to figure out which spirits make this unified evolution work. Sure it symbolizes one of Frontier's biggest flaws, but damned if it isn't inspiring. Alas, poor Oryxmon, we hardly knew ye. Seriously, what was the point of your existence if you're just going to get blown to bits in the first minute? How exactly does light pen somebody in anyway? It's not like they're frickin' laser beams. When Takuya and Koji get upgraded D-Tectors from Ophanimon, JP (Mr. “How Come I Can't Fusion Evolve?”) complains that his hasn't changed at all. Earth into Flame. Water into Light. Wind Wood into Flame. Metal into Light. Ice into Flame! Wind into Flame! Thunder into Light! Darkness into Light! By your powers combined, I AM CAPTAIN PLANET! This can be considered a pattern: Flame, Light, Flame, Light, Etc., and so on if you take the other elements. I must say, if Takuya's and Koji's D-Tectors were Digivolved, then they now bare the ring that appears on Susanoomon's back. Look at the D-Tectors and Susanoomon and compare the similarities; it's a fit, that ring on their D-Tectors can be a sneak peak of the upcoming Ancient Spirit Evolution into Susanoomon in episode 48: The Brothers Yin And Yang. Why do you hate Izumi that much ? !